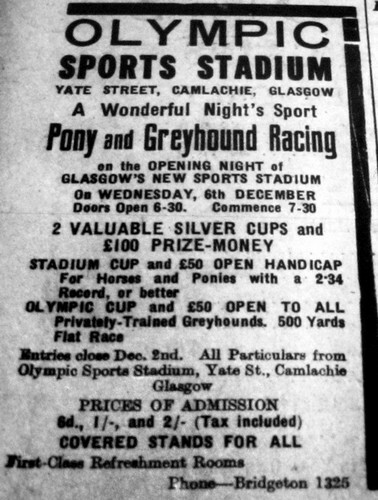 The Nelson family owned The Olympic Stadium in Porter Street Camlachie ,this was a well known Trotting and Greyhound track, (flapping track) the venue was also a speedway track and the events staged there were organised by the Glasgow Nelson Motor Cycle Dirt Track Club, the first such club to be established in Britain. 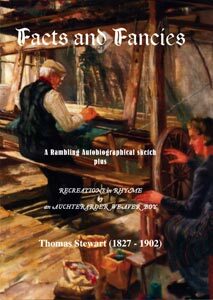 It was in 1897, the year of Queen Victoria’s Diamond Jubilee, when Tom Stewart, an Auchterarder weaver, decided to commit to writing his memories of seventy years. These memories are preserved in autobiographical form, in newspaper cuttings, in letters and poems composed by himself, and they tell of events that belong to the history book- the First Reform Act, the Disruption and the European revolutions of 1848 – as well as personal and local matters. His records have somehow survived a number of family removals with their usual clear-outs, and are contained in several notebooks, including the Auchterarder Poetic Album, an anthology of verses penned by a number of local poets including Stewart himself. 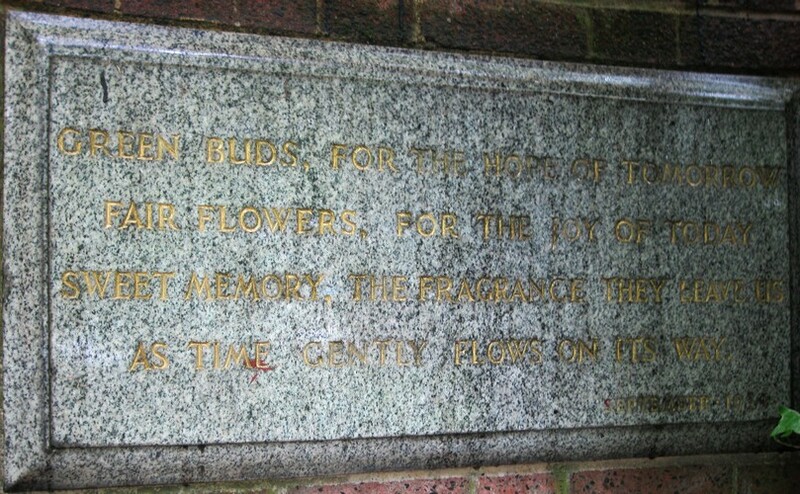 Green buds,for the hope of tomorrow.Fair flowers, for the joy of today.Sweet memory, the fragrance they leave us.As time gently flows on its way. 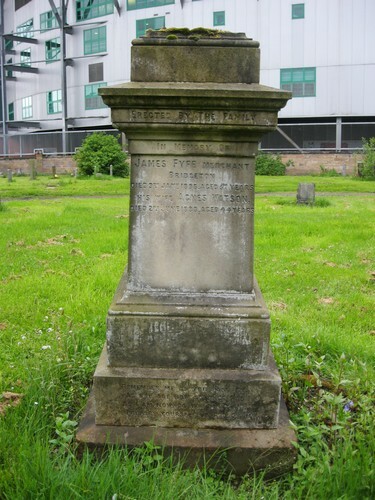 James Fyfe was the son of James Fyfe, a Handloom Weaver and Marion McNair. He was a Wine & Spirit merchant and had a long established business at 45 Dale Street, Bridgeton. It appears the business started around 1879-1880 at 45 Dale Street and James lived at 30 Harvie Street then. In 1880-1881 he lived at 80 Reid Street and the business was still at the same address. The business continued right up to his death in 1896 at 45 Dale Street with James living at 29 Main Street, Bridgeton. After his death the business was continued by the family and in 1902 a Robert Fyfe of 29 Main Street, on 7th February 1902 ceased to have any interest in the business. It was then carried on at 45 Dale Street, Bridgeton by Agnes Morton Fyfe, Wine & Spirit Merchant. It is not known what happened to the business after 1902-1903. 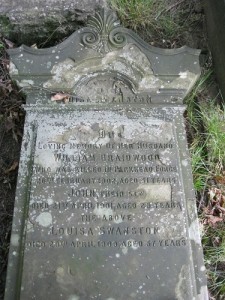 William was the son of Dugald Wilson Braidwood and Margaret Smith. 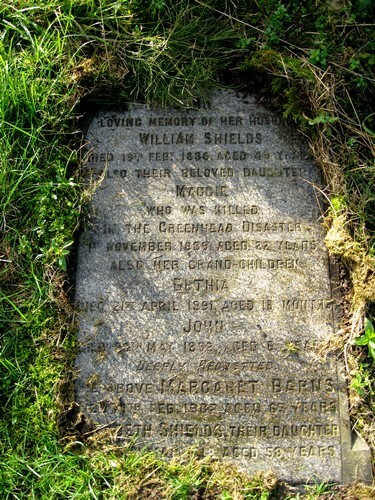 He was an Engine Fitter and died accidentally while working in Parkheaed Forge in February 1902. He was passing through one of the machinery shops when he sustained a severe head injury caused by a splinter which broke from an armour plate which was being chipped and dressed and this caused a severe cut and fractured his skull. His father Dugald Wilson Braidwood was an Assistant Fire Master. There may also be a possibility that William was related to James Braidwood who was a Fire Master of Edinburgh Fire Brigade and also London Fire Brigade. 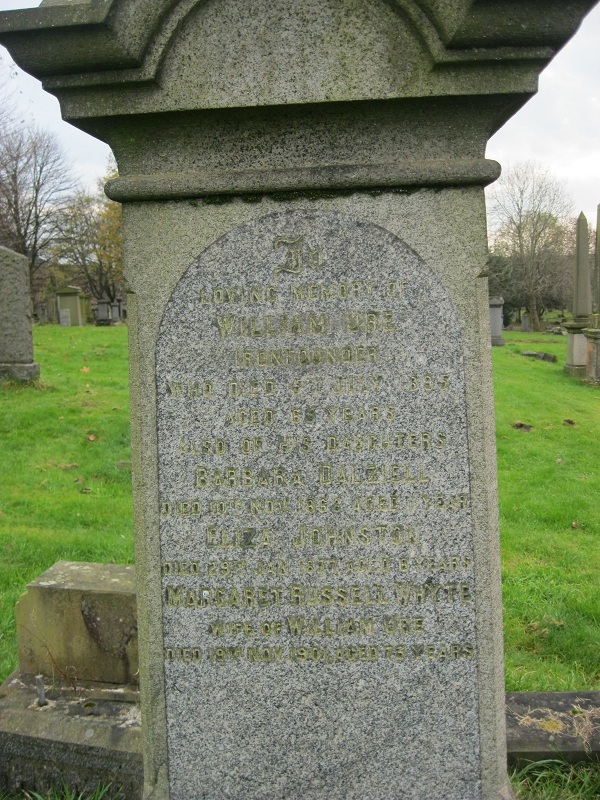 John Archer, Cabinetmaker, was born around 1847 and he died 23October 1911. 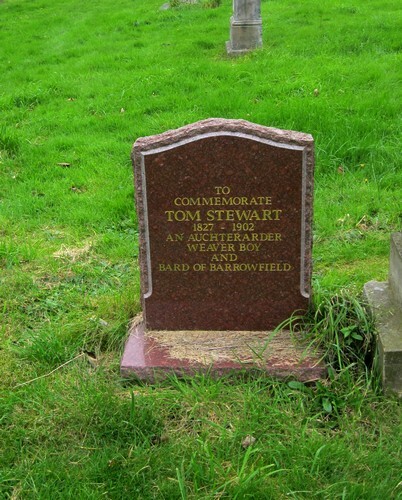 He was born in Ireland but moved to Glasgow and married a Jessie McArthur and had 11 children. He ran a Cabinet Making & Upholstery business from 55 Duke Street with his son Samuel and lived at 473 Main Street, Shettleston. The business was listed as Samuel Archer & Company from around 1894. His son Samuel was born around 1870 and died 31 October 1945 aged 75 years. 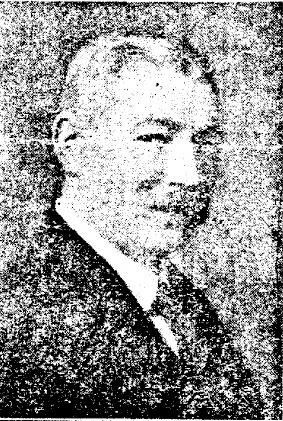 Reverend William Eason (Easton) – The 1st Ordained Minister of Camlachie. The inscription on the stone reads:- The Rev. 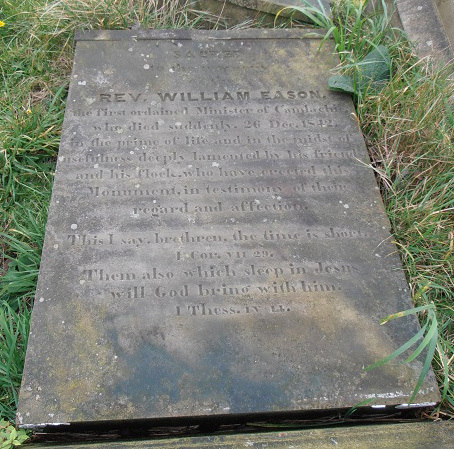 William Eason, The first ordained Minister of Camlachie who died suddenly, 26 December 1842 in the prime of his life and in the midst of usefulness. Deeply lamented by his friends and his flock, who have erected this Monument in testimony of their regard and affection. In 1837 the General Assembly granted a constitution for a chapel here known as Camlachie Mission. The parish of Parkhead was erected on 20thNovember 1867. The inscription raeds; Erected by Isabella & Mary Baillie in Memory of our beloved brother William Baillie, Late Superintendent, Oriental Inland Steam Company, Karrachee, Scand, India, who died suddenly at Deanston, 4 November 1870, aged 34 years. 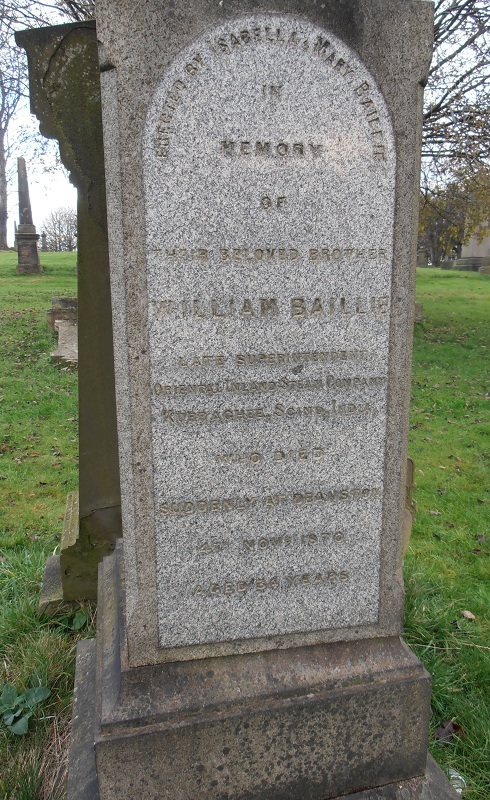 William was the son of Alexander Baillie, a Sawyer (worker in a sawmill or timber pit) and Isabella Baillie. He died from a fall on the back of the head and a probable fractured skull. He was listed as a Spirit Merchant and was single at death. The company was established in 1856. In 1856 the Oriental Inland Steam Company obtained a yearly subsidy of Rs 50,000 annually from the Government. It started its business in 1858 with a capital of 250000 British Pounds for the purpose of navigating main rivers of India with “steam Trains” consisting of trains of barges drawn by powerful steamers but this company collapsed due to mismanagement and all of its fleet was sold by 1869. It is said that river currents in Indus also proved too strong for the lighghtly built steamers of Oriental Inland Steam Company and played a role in its fast demise. William Ure, Ironfounder was the son of John Ure, Ironfounder and Barbara Dalziel and was born in 1831. 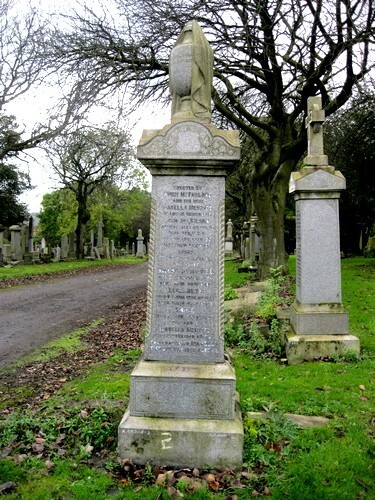 He married Margaret Russell Whyte in 1856 and the couple had 7 children, 3 boys and 4 girls. 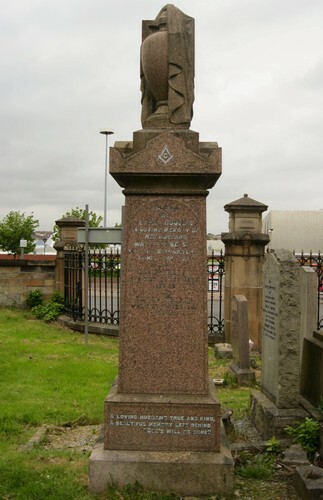 He died on 5th July 1895 from pneumonia aged 65 years at Altidare, Cambuslang. William ran a business called William Ure, Iron and Maleable Cast Iron Founder, with premises at Crownpoint Foundry, 157 Crownpoint Street, Mile End. The business was there from approximately 1864-1865 to approximately 1907-1908. William and Family resided at the following adresses at 1880-1881 – 21 Whitevale Street; 1875-1876 – 3 Armadale Street; and 1870-1871 – 20 Whitevale Street. It is believed his sons were also involved in the business and ran it after their father’ death. The three sons were also involved in a Bakery business called A. R. Ure (Northern Bakery) from premises at 459 to 465 St. Georges’ Road from 1894-1895 until 1898 when the two elder brothers retired from the business. The said Archibald Robertson Ure and the Trustees of the late William Ure continued to run the business under the said Firm name of A. R. Ure. The business later became A. R. Ure & Young and Archibald Robertson Ure was listed as still being of the business in 1933-1934 aged then about 72 years.